The colony-forming unit (CFU) assay is the gold standard for measuring the number of functional progenitor cells in hematopoietic cell samples. The CFU assay involves culturing cells in semi-solid medium containing cytokines for a period of 7 - 14 days. Faster, flow cytometry-based methods for the enumeration of human hematopoietic stem and progenitor cells (HSPCs), typically involving quantitation of cells that express the cell surface marker CD34, have been used as alternatives to the CFU assay. However, the CD34+ cell population contains both primitive stem cells and more mature progenitor cells, so this marker alone is not sufficient for identifying the most primitive cell types. Metabolically active, primitive HSPCs can be identified by their high expression of the intracellular enzyme aldehyde dehydrogenase (ALDH). 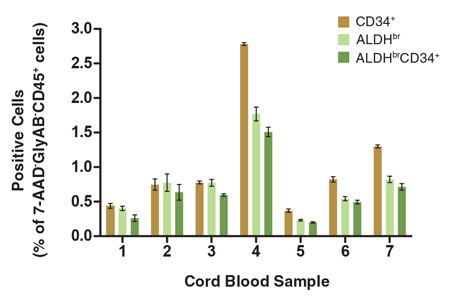 The so-called ALDH “bright” (ALDHbr) subset of the CD34+ cell population is highly enriched in stem cells that are capable of regenerating the hematopoietic system after transplantation into immunodeficient mice.1-4 Additionally, the percentage of ALDHbr cells in a cord blood (CB) unit has been shown to be useful for predicting engraftment after unrelated allogeneic transplantation.5 The ALDHbr assay is thus a faster alternative to the CFU assay, and increases the power of traditional CD34 phenotyping assays for quantifying primitive HSPCs. The ALDHbr assay was recently validated by Shoulars et al. 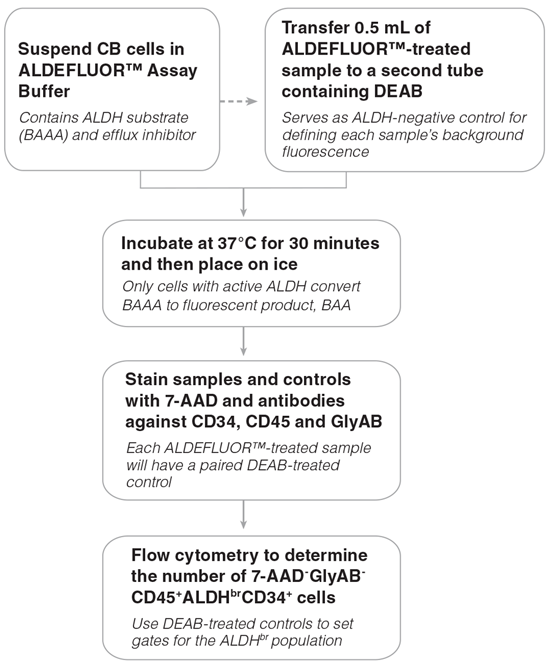 for its utility in measuring the frequency of viable, metabolically active HSPCs in CB.5 This assay combines the measurement of a cell’s ALDH activity using ALDEFLUOR™, with staining for cell surface marker expression (Figure 1). For a detailed protocol please refer to the Product Information Sheet accompanying the ALDHbr Assay Kit (Documents #DX20340 and DX20507) or on our website at www.stemcell.com..
FAST. Quantifies primitive HSCs in < 1 day. SPECIALIZED. Optimized to detect ALDHbrCD34+ cells in CB. RELEVANT. Enumerates viable, metabolically active, primitive cells in the CD34+ cell population. CB mononuclear cells (106 cells/mL) were stained with the ALDHbr Assay Kit and analyzed on a flow cytometer equipped with 488 nm and 625 nm lasers for detecting ALDEFLUOR™ (BAA), 7-AAD, APC, PE and PE-Cyanine5 fluorescence. The gating strategy for identifying (A) 7-AAD-GlyAB-CD45+ALDHbrCD34+ cells is shown using a fully stained sample (Sample) as described above. Staining of a (B) DEAB negative-control sample (Negative Control) is used to verify the placement of the ALDHbr gate. Gold lines depict the gates used at each stage to identify the desired cell types. 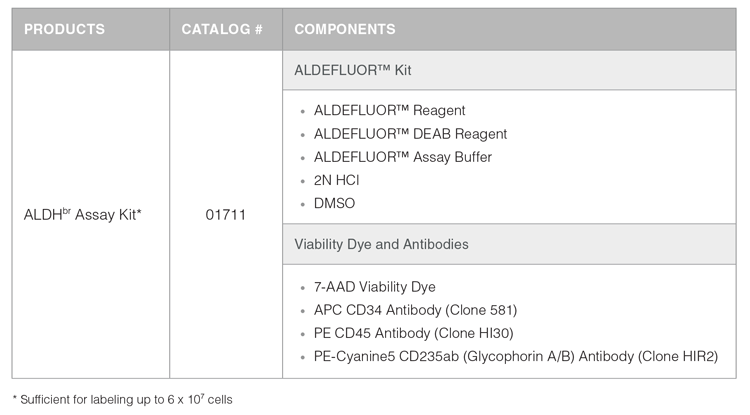 Note: The gating of ALDHbr cells is greatly simplified if red blood cells (RBCs) are first removed from CB samples, prior to staining with ALDEFLUOR™. The ErythroClear™ Red Blood Cell Depletion Kit (Catalog #01739) is designed for the depletion of RBCs from up to 16 small volume CB samples. CB mononuclear cells (n = 23) were split into two parts. Half of each sample was stained with the ALDHbr Assay Kit and analyzed, as described in Figure 1. 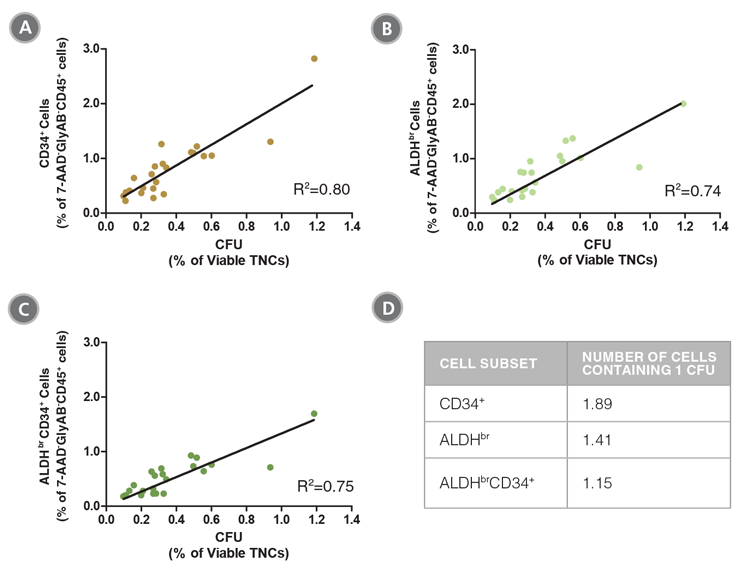 The percentages of (A) CD34+, (B) ALDHbr and (C) ALDHbrCD34+ cells in the 7-AAD-GlyAB-CD45+ population in each sample was determined. The other half of each sample was plated in a CFU assay using MethoCult™ Classic H4434 medium (Catalog #04434) and colonies were counted 14 days later. The frequency of CFUs was determined as a percentage of viable total nucleated cells (TNCs) for each sample. The table (D) shows the number of cells from each subpopulation that contains 1 CFU. The data show that the frequency of ALDHbrCD34+ cells is highly correlated with the frequency of functional progenitor cells (R2: correlation coefficient). CB mononuclear cells (106 cells/mL) were stained and analyzed as described (Figure 1). Shown are the percentages of cells in the 7-AAD-GlyAB-CD45+ gated population that are CD34+, ALDHbr and ALDHbrCD34+. Each column represents the mean ± S.D. of three replicate assays for each CB sample (n = 7). 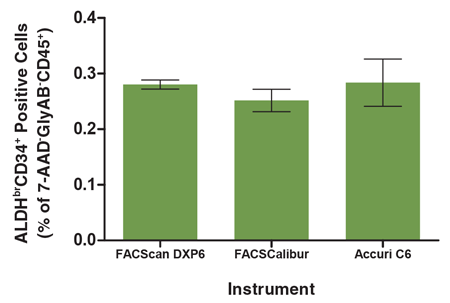 A single CB mononuclear cell sample (106 cells/mL) was split into 3 parts, each of which was separately stained with the ALDHbr Assay Kit (see Figure 1 for protocol) and separately analyzed on three different flow cytometry instruments; a FACScan DXP6, FACSCalibur and Accuri C6. All instruments were equipped with 488 nm and 635 nm lasers for detecting ALDEFLUOR™ (BAA), 7-AAD, APC, PE and PE-Cyanine5 fluorescence. The frequency of ALDHbrCD34+ cells in each sample was determined as a percentage of the 7-AAD-GlyAB-CD45+ cell population measured by each instrument. There was no significant difference in the number of ALDHbrCD34+ cells measured by these flow cytometers (p > 0.05). Each column represents the mean ± S.D. for three replicates of the analyzed CB sample evaluated on each flow cytometer. *Not included in the ALDHbr Assay Kit. To improve the resolution of rare ALDHbr cells, use the ErythroClear™ Red Blood Cell Depletion Kit (Catalog #01739) to remove RBCs from CB samples prior to staining. ErythroClear™ can deplete RBCs from up to 16 small volume CB samples at once. For related products, including specialized culture media and supplements, storage media and antibodies visit www.stemcell.com/CBworkflow or contact us at techsupport@stemcell.com. Hess DA et al. (2004) Blood 104(6): 1648-55. Storms RW et al. (2005) Blood 106(1): 95-102. Chris O et al. (2007) Haematologica 92(9): 1165-72. Boxall SA et al. (2009) Bone Marrow Transpl 43(8): 627-35. Shoulars K et al. (2016) Blood 127(19):2346-54.